The Chinese Staircase has got to be the easiest friendship bracelet ever, short of tying a single piece of string onto your wrist and calling it a bracelet. 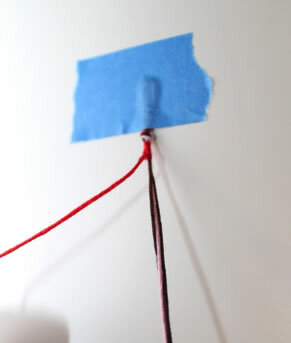 It's even easier than the Candy Stripe that I used to call the easiest. (See? I can admit mistakes. I'm growing as a person). Shall we continue on with the instructions? *This is for a 2 color bracelet. The chinese staircase bracelet is a flexible project. You can use a rainbow of colors or just 2, it's entirely up to you. In this tutorial I'm using just 2 colors, but once you make a 2-color bracelet, it's easy to see how to make one with more colors. You'll see tips for making a bracelet with more colors at the end of the tutorial. About 45 minutes or less if you are focused, I think. I'm not, so it took me longer in front of the TV. 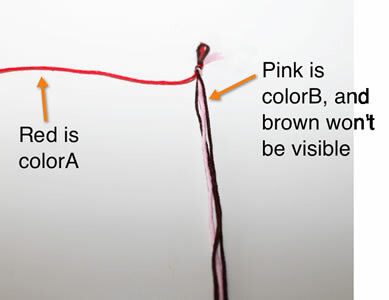 1 length of red (colorA) yarn or embroidery floss 48"
1 lengths of pink (colorB) cut 48"
Fold the brown strand (your anchor strand) in half, and line up the top of the fold with one end of each the pink and red strands. 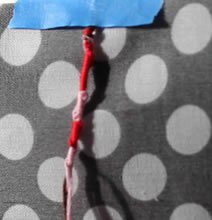 You now have two long strands attached to a folded (soon to be hidden) short strand. Make your first "Half-Hitch" knot. (Macrame lingo, natch). ...then reach into the loop of the 4 from the front, and grab the loose end of colorA and pull through. 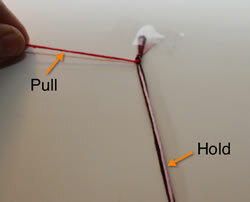 Tighten the knot by pulling colorA yarn up and tight. Repeat Step 3 over and over as needed, i.e. 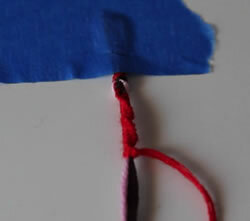 continue making the half-hitch knots until you want to change to colorB. The knot will start to spiral -- this is fine. 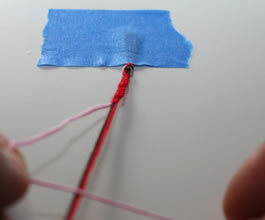 Use colorB as the knotting strand by separating it out of the rest. 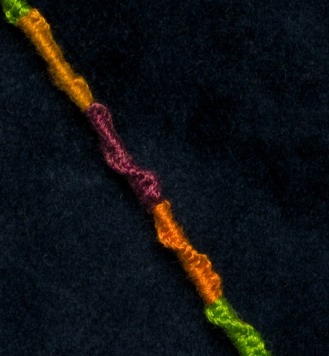 ColorA joins in with the brown and the red and brown are now the strands that become hidden. Repeat steps 5 and 6 until you reach about 5 inches long or the size of your wrist minus a bit. To tie it off, trim the loose strands to about 3 inches or so. You can tie it onto your wrist using the below instructions. 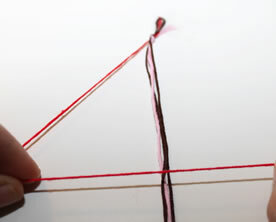 (It would look like the same, except without the strings being braided). Lay your wrist on the bracelet. 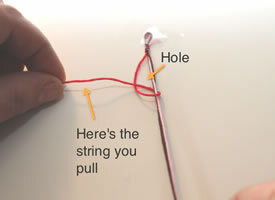 Pull one or two strands of the floss through the loop and tie to the other remaining strands. You are finished! Make one using just two colors first, exaclty the same as in the tutorial. Once you make one with 2 colors, it's really easy to figure out how to add more colors. The more colors you have, the fatter the chinese staircase bracelet. 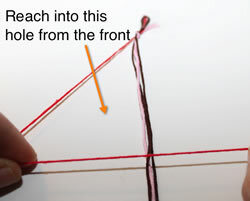 Also the shorter any one individual strand needs to be because you don't use it to knot as much. (If that's confusing, make a few bracelets. It is much more complicated in words than it actually is to do).